Prime Minister's Office says failure to move embassy to capital reinforces Arab delusions that Jews have no connection to Jerusalem. 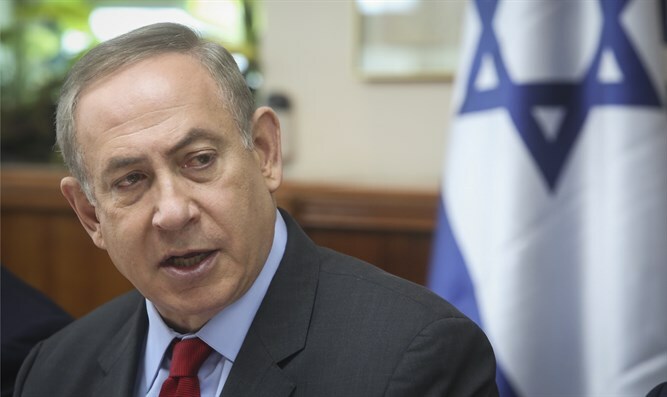 Prime Minister Binyamin Netanyahu expressed his regret at the decision of US President Donald Trump to sign the waiver allowing him to keep the US embassy in Israel in Tel Aviv instead of relocating the embassy to the capital, Jerusalem. "Israel's consistent position is that the US Embassy, as well as the rest of the embassies, should be in Jerusalem," the Prime Minister's Office said in a statement. "The existence of embassies outside the capital distances peace, because it contributes to the revival of the illusion that the Jewish people and its state have no connection to Jerusalem. "Despite the disappointment at the lack of transfer of the embassy at this time, Israel appreciates President Trump's friendship and his commitment to the subsequent transfer of the embassy," the statement concluded. President Trump had promised during his 2016 White House campaign to move the embassy to the Israeli capital if elected. "We will move the American embassy to the eternal capital of the Jewish people, Jerusalem,” Trump said at the 2016 AIPAC conference in Washington DC. After the November election, however, Trump remained mum on whether he intended to follow through on his pledge. The waiver signed Thursday defers implementation of the 1995 Jerusalem Embassy Act, which requires the US Embassy in Israel be relocated to the Israeli capital. Every president since Bill Clinton has invoked the act’s emergency waiver to defer relocation of the embassy. Despite Trump’s signing of the order deferring the embassy’s relocation, a senior US official said the move was a temporary delay, insisting the White House still intends to make good on Trump’s 2016 campaign promise. "It's a question of when, not if," the official said, AFP reported, adding that "he doesn't think the timing is right, right now." "In timing such a move he will seek to maximize the chances of successfully negotiating a deal between Israel and the Palestinians."